Send url to Erica Sadun's AirFlick. You need install AirFlick to your Mac OS X. Since Version 1.5, You don't need AirFlick(You can use AirFlick opt-in.) so not only works on Mac OS X, but also Windows. This is watching your page loading. This adds "send to AirFlick!" link to send the media url to AirFlick, if Apple TV 2 may possibly play it. With below site's Video streams, I know SendToAirFlick works. www.dailymotion.com with "HTML5 Player Beta"
with iOS playable contents only. 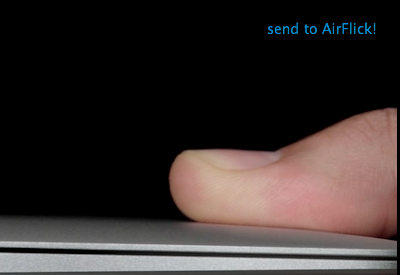 If you use Chrome, RockMelt or WebKit Nightly, you can see "send to AirPlay!" link at upper right corner of image, you can see "send image to AirPlay!" context menu on image.